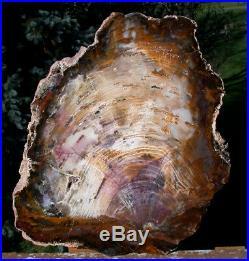 This fabulous, highly polished beauty comes from one of the most interesting and uniquely patterned Hubbard Basin petrified wood specimens I’ve recently cut – it’s much better and has far more wood grain than even the photo suggests – you are sure to love it! The wood grain in this piece stands out more than many Hubbard Basin conifers right down to the resin canals in the intricately preserved growth rings! If you look closely, this one even appears to show the arcs of insect boring tunnels suggesting this tree had already fallen for a period of time before it was entombed to begin the slow mineral replacement process of becoming petrified wood. The color really brings out the wood grain in this piece and the polish really shows it off right. It’s hard to believe nature can produce something this amazing from a fallen tree!! 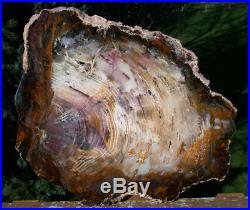 It’s really an unusual and attractive Hubbard Basin, Nevada, petrified wood specimen! While you can still find the occasional specimen from this location, it is invariably either badly fractured or lacking the distinctive color that made this location famous. Commercial dealers that have it at all usually display more fill (the trade term for glue) than color in their hastily prepared specimens. We’re lucky to have secured the selection of intensely colorful, perfectly preserved specimens we have over the last few years and we’re happy to be able to help you add a truly collectible specimen to your own collection! Our stock represents the finest collection of. Specimens you’ll ever find and we’re proud to be able to offer them at every day collector prices! Hubbard pieces fetch a price commensurate with the color found in them if you’re going to invest in one, it simply has to be a specimen with wonderful color! Our imitators will try, but they simply cant match the quality and price of our fine petrified wood collectibles and our finish really does stand up to the scrutiny required to claim its the best in the business! This log was dug a few years ago by a close friend. The color in this exceptional representative of the variety isn’t often seen with this kind of intensity. This is a truly amazing piece of petrified wood. I’d been collecting petrified wood for several years before I came across my first piece of. Wood and I simply couldn’t believe my eyes. You don’t have to be a petrified wood collector to appreciate how uniquely beautiful this agatized fossil from an ancient forest is. While the wood looks punky, rotten and brittle on the outside, when you touch it you realize quickly that it’s not brittle at all, but quite hard and textured something like coral on the edges and solid agate throughout. The interior is typically preserved in blue and gold agate with black, white, red, pink and other colors sometimes filling in the spectrum. The wood isn’t common as the digging is quite difficult and the. Desert that it comes from is freezing cold in the winter and blistering hot in the summer. In other words, there isn’t a lot of the high quality variety of this treasure in circulation. Our supply is arguably the best in the world, and this fine specimen demonstrates why we can make that claim! I guarantee that once you’ve added a piece of this spectacular, highly agatized wood to your collection you won’t look at any other petrified wood with quite so much admiration again. It’s that gorgeous! The color in the wood grain in this slab is very rich and very blue compared to most Hubbards (or any other wood that can even remotely claim to be “blue”) – quite beautiful and an excellent piece to show the flowing wood grain! It’s easily identifiable as a conifer and appears to have small resin canals which are consistent with spruce or fir. The color variety in the wood grain is incredible. Truly a stunning piece, but perhaps best of all it is finished with a quality finish that only Sticks-in-Stones Lapidary provides consistently on every piece we sell! Our lapidary process produces the finest finish in the business and when you hold this piece in your own hands we know you’ll agree. This large slab measures about 12 3/4″ across the widest points or 11 1/2″ x 9 3/4 across the mirror polished face as it sits in the photo. It weighs 4.04 lbs. It’s cut about 0.53 thick. A nice, unique naturally wonderful stone collectible exclusively from Sticks-in-Stones Lapidary. The item “SiS GORGEOUS 12+ Hubbard Basin Petrified Wood Slab INSANE WOOD GRAINY” is in sale since Wednesday, February 6, 2019. This item is in the category “Collectibles\Rocks, Fossils & Minerals\Fossils\Vegetation\Petrified Wood”. The seller is “rockshop” and is located in Beaverton, Oregon. This item can be shipped worldwide.